The "Arab Spring" has been synonymous with secular and peaceful demonstrators taking to the streets of the Middle East and, in some cases, taking up arms to fight for lost freedoms. However, the latest issue of al-Qaida's Inspire Magazine, as well as the rise of renewed Salafist movements in the revolutionary states, suggest that religious ultraconservatives have no intention of ceding the future. The revolutions may have been secular, but the character of new governments is still up for grabs. Salafist Islam, in both its violent and peaceful incarnations, believes that Islam has moved away from its roots and that Muslims are in dire need of re-Islamization of daily life, politics, economics, and culture. To restore the lost Islamic empire of the caliphate, groups like al-Qaida turn to violent jihad, while Salafists in Saudi Arabia fund the growth of their movement throughout the world. Rather than interpret largely secular revolutions as their end, Salafists view the fall of dictators as the first step on the road to a new caliphate. The revolutionaries have cleared the path, and whatever will come after them will be less resistant to a message of political Islam or to violent takeover. "The biggest barrier between the mujahidin and freeing al-Aqsa [Jersualem] were the tyrant rulers," writer Yahya Ibrahim noted in his introductory article to the latest issue of Inspire. "Now that the friends of America and Israel are being mopped out one after the other, our aspirations are great that the path between us and al-Aqsa [Jerusalem] is clearing up." "Another line that is being pushed by Western leaders is that because the protests in Egypt and Tunisia were peaceful, they proved al-Qaida – which calls for armed struggle – to be wrong. That is another fallacy," Ibrahim argues. "Al-Qaida is not against regime changes through protests but is against the idea that the change should be only through peaceful means to the exclusion of the use of force." For Anwar al-Awlaki, an influential al-Qaida ideologue, clearing out the tyrants means greater freedom of movement and recruiting. "We do not know yet what the outcome [of the revolutions] would be, and we do not have to," he writes. "Regardless of the outcome, whether it is an Islamic government or the likes of [Egyptian presidential candidates] al-Baradi, Amr Mousa or another military figure; whatever this outcome is, our mujahidin brothers in Tunisia, Egypt, Libya and the rest of the Muslim world will get a chance to breathe again after three decades of suffocation." Awlaki also argues that an end to fear opens the way for peaceful Salafi activists to have a voice. "For the scholars and activists of Egypt to be able to speak again freely, it would represent a great leap forward for the mujahidin." The fall of the regimes has meant an end to fear among other Salafist groups, who are no longer afraid to express their ideologies or to mobilize support among the people. They argue that the people should give Islam a chance to rule, when secular regimes have only brought corruption and unemployment, shame and military defeat. "These events are paving the way for a greater thing to come. They are paving the way for a great Islam that is coming with force because the world is in need of leadership," Dr. Muhammad Musa Al-Sharif, Salafi cleric and assistant professor in the Department of Islamic Studies in King Abdul Aziz University, told viewers of Saudi Arabia's Iqra TV on Feb. 25. "The current leadership – Communism, capitalism, and so on – has gone bankrupt. Only Islam is left to lead the world… Islamic leadership is coming whether people like it or not." In Egypt, where religious opposition to the former regime was more organized than its secular counterparts, the effects are being felt. "Their rhetoric hasn't changed but the new Egypt allows them to express it freely, even though it may not be welcome by all," al-Jazeera's Zeina Khodr reports from Alexandria, Egypt. "Salafists were never involved in politics, just like other groups under the Mubarak regime, they were suppressed. Now religious leaders are explaining to their supporters the need for political participation, to create the Egypt they want." "There is an ideological battle at the heart of the struggle to fill the ideological vacuum. It may be a new Egypt, but it is an Egypt that has still not been defined." Khodr explains, as the program shows concerned secular activists trying to counter rising Salafist activism among the less educated. "There is a real fear, they say, Islamic groups could rise to power," Khodr states. Some say the threat of a Salafi takeover is exaggerated and that the rise of Western democracy in the Arab world will drown the radical agenda. "There really is no hankering in the Middle East for a return to the 7th century, only a desire for jobs, pluralism, freedom, good government," Fareed Zakaria argued recently on CNN. "So can we all take a deep breath, stop cowering in fear of the impending caliphate, and put the problem of Islamic terrorism in perspective. It's real, but it is not going to take over the world any time soon." It is too soon to know what success the religious conservatives will enjoy. It is clear, though, that they are working to seize authority and to remake secular Egypt into an Islamic state. But peaceful activism for the ballot doesn't mean that such groups have renounced their demand to force Islamic law on others. On Tuesday, Salafists killed one and injured eight others in the Egyptian village of Kasr El-Bassil. The attack came after local Salafists ordered the owner of a liquor store and coffee shops to close his businesses for violating Islamic law. Elsewhere in Egypt, Coptic Christians evacuated 340 female students from their university dorms to church-affiliated sanctuaries over concerns for their safety. The move followed renewed anti-Christian protests over the supposed kidnapping of an Islamic convert. In the city of Monufiya, dozens of Salafis stormed a woman's house, accused her of being a prostitute, and burned her furniture in the street. Salafist preachers and politics are becoming increasingly assertive in rural villages, even according to the Islamists of the Muslim Brotherhood. "Suffice it to say that there are some villages where Salafists have total control," Kamal Samir Gadallah, a Muslim Brotherhood activist, told the Washington Post. "And when the revolution succeeded, we started seeing Salafists speaking out for the first time on politics." Mubarak tolerated Salafis to serve as a check on the Muslim Brotherhood, according to an Associated Press report. The Salafist movement "has gained power as it rises to play a more political role as followers now ponder nominating a presidential candidate. That has alarmed many of the secular and liberal forces in Egypt because of the group's extremist discourse and imposition of Islamic sharia law." Likewise, concerns about the rise of al-Qaida and Salafist movements are common in Libya, Jordan, and Yemen. Libyan rebel leader Abdel-Hakim al-Hasidi admitted that "around 25" of his troops fought coalition troops in Iraq. But they "are patriots and good Muslims, not terrorists," he insisted. Even "members of al-Qaeda are good Muslims and are fighting against the invader." Al-Hasidi also claimed that he had fought against "the foreign invasion" in Afghanistan, until he was captured and later transferred back to Libya. Tayseer Abu-Obada, a militant convicted of terrorism by the Jordanian government, told the AP that local Salafists were taking advantage "of the atmosphere of openness we're witnessing these days." 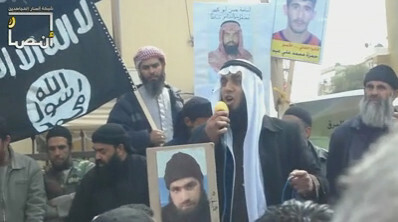 Hundreds gathered at protests waving flags used by al-Qaida and demanding the release of terrorist ideologue Abu-Mohammad al-Maqdisi and other militants facing terrorism charges. They also demanded Islamic law be imposed on the state and called for jihad as "our way to liberate Muslim lands from autocrats." "An Islamic state is coming," U.S.-Specially Designated Global Terrorist Abdul Majid al-Zindani told a cheering crowd in Sanaa, Yemen on March 2nd. Al-Zindani, who was blacklisted because of his close relationship to Osama bin Laden and al-Qaida, is a key opposition figure. He told the crowd that Yemeni President Ali Saleh had "came to power by force and stayed in power by force, and the only way to get rid of him is through the force of the people." Al-Qaida also stands to benefit from the fall of the Yemeni regime and the stark challenges facing any incoming government. "There are ways in which Saleh has exploited the existence of AQAP in the country, but the organization itself exists independently of the president," says Gregory Johnsen, a Yemen scholar at Princeton University. "If the government that comes next in Yemen is unable to deal with the harsh economic realities and some of the demands of the protesters, Al Qaeda will be in a good position to capitalize."